In archery circles, few names are better known than Fred Bear and I like to think that his real brainchild was the Grizzly which he spent over a decade perfecting. The Bear Grizzly Recurve Bow which is compact, lightweight, and fast was a turning point for Bear Archery. Made since the 1950s, the Grizzly holds a special place in traditional archery circles to this day and while it may not be the Cadillac of bows, it is an upstanding example of what modern materials can do! Who should be Interested in the Bear Grizzly Recurve Bow? Keep reading this Bear Grizzly Recurve Bow review to see how it held up when we reviewed it. The feel and ergonomics match much more expensive bows. One piece construction makes it somewhat less desirable as a survival bow. Requires some level of skill to shoot well. Who should be Interested in the Bear Grizzly Bow? In a market where bows go into the thousands of dollars, the Grizzly is still a fairly budget option with very few compromises. It should appeal readily to those hunters, outdoorsmen, and bow fanatics looking to get back to the simpler roots of archery rather than the mechanical ugliness of compound bows. For those just getting into archery, the Grizzly may seem a bit pricey, especially when adding in the cost of arrows and the rest of the kit. But if your budget allows, the Grizzly is a beautiful bow that functions well and will stand the test of time. The Grizzly in my collection was built in 1968 and I still shoot it today. If you’re looking for a long-term survival bow for the homestead or bug out location then this is the bow for you. This isn’t the bow for someone looking for a bow to toss in a bug out bag. Starting with numbers, the Bear Grizzly is only 58” with an optimal draw length of 28.” For a bow that short, I would not recommend a draw length greater than 28”. It is available in draw weights from 30 to 60 pounds and gets decent performance from draw lengths down to about 25” with little loss of power. The bow has a one-piece hard maple riser that has been stained a deep brownish red with black fiberglass laminates. 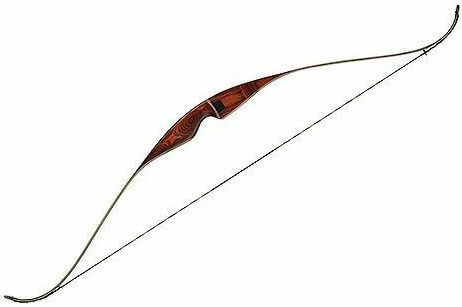 Weighing in at just over three pounds with fine shaping and contouring, it is a comfortable bow. The Grizzly is bare bones with no attachment points which gives it a clean, classic look. One of the most notable features of the Bear Grizzly Recurve Bow is its one-piece fiberglass back that will absolutely prevent peeling or delamination and last a lifetime or more! This is a bow that you will pass down to your kids and with a little care, your grandkids. A bow pulling 45lbs at 28” can launch arrows in excess 185fps which translates to a lot of penetration if you are using the bow for hunting. Every big game animal in North America has been brought down by this bow at some point in its 70-year history. Talk about tried and true! The Grizzly is one piece so it eliminates any notable points of failure and is well shaped with a handle that settles nicely into the hand and keeps the bow secure throughout the draw and shot. The dark coloration blends in well in the woodlands to prevent spooking animals during the draw and looks good enough to show off at the target range. Both the draw and release of the bow are smooth and consistent throughout. There is no hand shock, just pleasurable feedback as the arrow is launched. The Bear Grizzly Bow isn’t exactly cheap at a price of $400.00. You do get a lot of bow for that price but the cost may be a big setback if you are on a budget. First-time bow buyers may be hesitant to make such an investment if they are unsure archery is something they want to pursue. The shorter length and faster arrow speed can be an asset but it also makes the bow more challenging to shoot well. It is a pretty unforgiving bow where each little mistake can throw you off target. If this is your first bow, it may be frustrating trying to lock down proper form. The lack of a takedown option limits how the bow can be stored and transported and the lack of attachment points limit how the bow can be used. Additionally, this bow is designed to use a Dacron string which has some stretch and could be a limiting factor if times get really tough. The ergonomics are generally fine and the bow is fairly comfortable to shoot but I find the front of the grip to be a little too square for my liking. The size is close to perfect but even with no hand shock, the corners get annoying if you shoot repetitively. The Bear Grizzly Recurve Bow is beautiful to look at with a styling that reminisces of traditional archery’s prime. Though there are some slight issues, shooting is pleasurable. Though it seems a lot of negatives against this bow, don’t be fooled into thinking it’s bad. This is one of the best bows I have shot and one I will continue to love as long as I can draw the string. If you are just getting into archery and want a bow that you can learn on and continue to use throughout your life, this would be a great choice. It will do all you need to do from target shooting to hunting and it will do it well as long as you take the time to learn. Be cautious that this can be a gateway into the world of Bear Archery which can get pretty costly. Was our Bear Grizzly Bow review helpful? Let us know in the comments below. 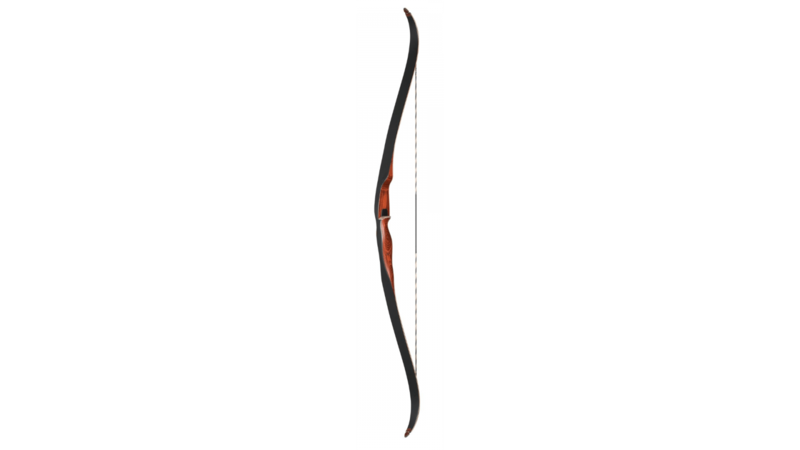 This bow is the classic recurve bow style we recommend for many survival situations.